Founded in 1836, the historic Emory and Henry College is believed to be haunted. A hanging lamp outside the Music Hall is said to swing by itself, stemming from a heated debate in which a man was pushed out the third story window. He grabbed the lamp and hung from it briefly before falling to his death. Piano playing is also said to be heard when no one is there, and a woman who hanged herself from the shower stall in the MaWa Hall is said to squirt water from the wall. Regarding the woman in mawa there’s no doubt she still likes to make her presence known. I lived in the dorm last year and I recall getting a feeling like I was being strangled or choked while in the shower. Later while researching the sensation I felt made sense. The building had a creepy feeling to it and was not one I wanted to be alone in the room in. Rumor has it that there have been vampires among the student body for centuries ever since the civil war. Also, the clock tower chimes at exactly 3am on some nights. Further investigation has led to no answers to the phenomenon. You couldn’t pay me enough to go to such a paranormal school. Yes, this rumor is true. It actually happened quite a bit last year. I lived in the residence hall beside the church and the bells started chiming at 3 am on the dot. My roommate’s boyfriend was the head RA of the residence hall and he got a call that he had to go help turn off the bells. He almost jokingly said that the ghost in the church was at it again and they had to go turn off the bells. Also, during this, there was a blue glow in the tower when none of the lights in the church were on. does anyone know which room on the 4th floor of WaMa has the haunted closet? I am writing a book of ghost stories, and interested in the stories. I’m curious to learn more about the vampire stories. Emory & Henry was used during the Civil War as a medical base for the confederacy that was fighting in nearby Saltville. Medical Civil War vampires that are still students? Interesting. Not sure if I can get behind that one, though. Apparently the French-Stuart house is haunted, as is the duck pond after a certain time of night. In fact, I think it was around 3 AM that noises can be heard by the duck pond. At the same time, bells from the church ring. People have looked into it and even turned off everything that could possibly make them ring at 3 AM, but it still happens sometimes. 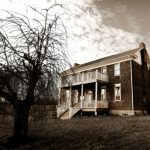 Byars is definitely haunted, and MaWa is definitely haunted. Friends that work in the French-Stuart house have confirmed paranormal activity whenever they work late. Another haunted place on campus is the chapel. If you look at the building during the morning of the first snow, rumor has it that a woman in a white wedding gown can be seen looking down and crying. If you enter the chapel then, there is an overwhelming smell of roses. I’m an ’91 EHC alumni and I have heard most of these stories, except the ones about the vampires. Vampires weren’t as popular as they are now. They weren’t as dominant in pop culture in the late 80’s early 90’s so, I never heard anything about vampires during my 4 years. But I did have several paranormal experiences in MaWa, the Civil War cemetery that overlooks the school, Wiley Hall (at night), the duck pond, the sometimes nighttime foggy field behind the duck pond near the tennis courts (with the lady in white) and a MaWa 4th floor room where some students used an Ouija board. My favorite story and the one I tell the most happened in the Music Hall, near the duck pond. As a freshman, during the middle of the day, I had teamed up with another fellow singer to go try out one of the piano rooms. He took me to the back of the building where the wrought iron spiral stairs led to a series of about 8 tiny piano rooms (& a couple of small class rooms). Half had no window, all had doors. We played show tunes for about an hour and my friend briefly left to use the rest room. From the piano room, I could clearly hear his hardback shoes clicking down the hallway, down the metal stairs into the basement where I could hear the men’s bathroom door swing when he entered. In the meantime, I continued playing the piano with the door open, listening for his return. A few moments passed and I heard his hardback shoes climb up the stairs again, down the hallway to where I sat waiting in the same piano room. I literally could feel him standing behind me. Without turning, I commented about some of music lyrics and asked him a silly question for which I chuckled. Eerie silence was the response. I turned around to find no one. I thought for a moment he had hid outside the door so, I went 2 feet and looked up and down the hall, calling out his name and asking why he was ‘playing with me.’ The other piano rooms were empty and some were locked. The class rooms were also empty. No one was on the floor. No way to get by me, no closets or places to hide, so where did he go? Standing at the top of the stairs, I hear my friend leave the men’s room, the door swings. He loudly climbs the stairs again until he faces me. He asks, “What’s wrong?” I frantically tell him and he says he felt that the place was creepy and haunted, even in the bathroom. We both feel chills and an eerie silence seems to engulf and dominate the space. I never SAW anything that day but I felt like it was someone who wanted me to leave. So we left. Actually, we ran out of the building feeling compelled to do so. Considering I was trying to be an music major and I had to practice in those rooms, I often did only when I knew the building was extremely full of people. Thus, I graduated as an music minor. But in those piano rooms, I never lost that feeling of spooky eerie-ness, almost like I was always unwelcome in that particular space. I too was told that those rooms and that building were used as a Civil War medical hospital or triage center for soldiers directly from the nearby battlefield. After graduation, I don’t think I ever went back in that building, though it has been remodeled since then. 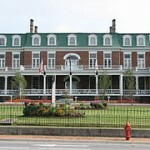 Martha Washington inn Abingdon va, been haunted for hundreds years, screams comes from empty rooms at night. And a little pub in town has a service elevator employees won’t even use, nobody stays alone to lock up at closing, to many proven things goes on still today. Come to Abingdon Virginia see for yourself.